Take the family for a day out where mam, dad and all the kids can get involved. The little ones love to play in the foam pit with mam whilst the big kids are showing dad how to climb the performance walls. This is the perfect session for families to enjoy a trampoline park without the age restrictions of general sessions. During this session, additional safety rules will apply to ensure all families can enjoy themselves in a safe environment. It will be strictly for families only with at least one child aged 2 – 5 years old – groups of young people and adults will be advised to join the next available Open Jump session. Sessions are held between 11am and 5pm Monday to Friday during term time with additional sessions at 11am – 12pm every Saturday and Sunday. Please check our timetable here and be sure to book in advance to avoid disappointment! All participants must be aged 2+ and within the weight limit of 16 stone. 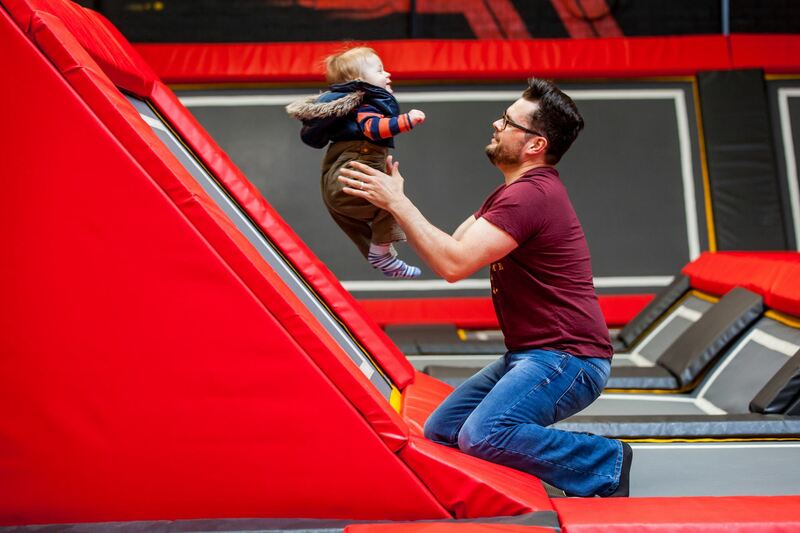 Children aged 2 to 5 must be supervised whilst on the trampolines by an adult aged 18+ on a 1 to 1 basis. Strict supervision rules apply. Grip socks must be worn in our park at all times. If you do not have any, grip socks are available to purchase in the park.